Android Now More Widely Used than iOS In U.S.
Nielsen, a research firm, has released new data on the smartphone market from March. It shows that Android has now surpassed iOS in the US smartphone market usage with 37% of the market. 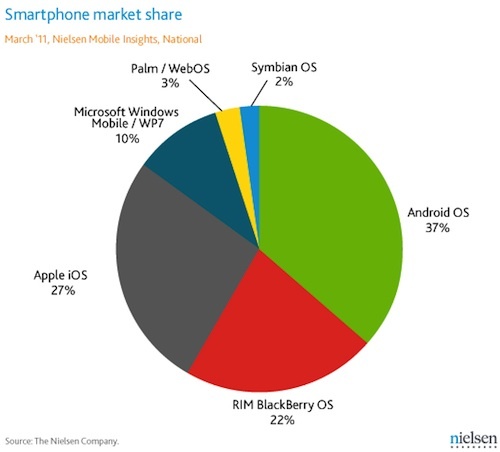 For what it’s worth, iOS still holds 27%, RIM holds 22%, Microsoft taking 10%, and everyone else taking 5%. In the six months leading up to when this data was collected in March, looking at the number of people acquiring Android takes the lead with 50%. 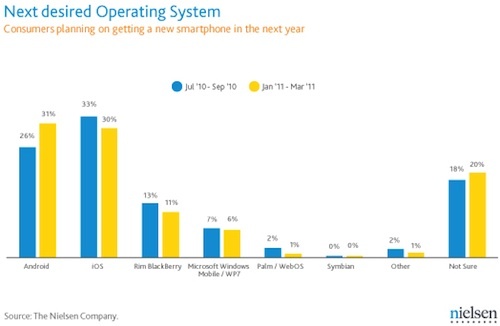 Apple followed with 25%, RIM with 15% (they’re in trouble), and the rest with 10%. Lastly, and I think most interestingly, when consumers were asked what smartphone platform they would stick with a year out, when buying a new device, Android now barely beats out iOS with 31% compared to iOS’s 30%. This is a jump from September’s numbers that showed iOS at 33% and Android at 26%. To my eyes, things are beginning to level out, and Android and iOS are emerging as the two dominant smartphone OSes. 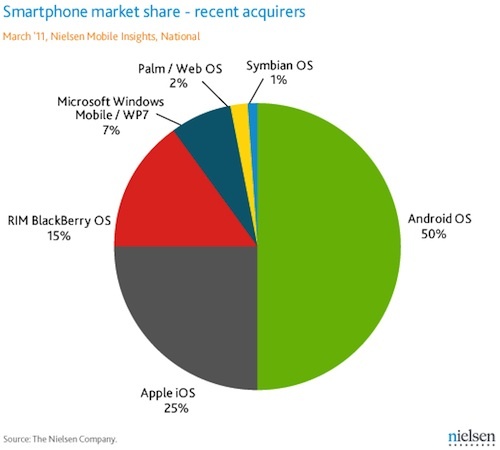 The others, with the likes of Microsoft and RIM, are falling out of the equation. With that in mind, I don’t believe the smartphone market will settle around one OS like the PC market essentially did in the 90s. Data and charts courtesy of Nielsen. I wonder what the charts look like if you also include tablets running iOS and Android. I have been ranting on that topic for a while now, Matt. These smartphone-only studies and reports are a freaking waste of everyone’s time. Nielsen does thorough breakdowns, but the information is still incomplete, and therefore totally useless. Also, take a look at this same report as the summer goes along, and the release of the iPhone 5 gets closer. I would wager we will all see a very different story then, as the rumors and reports on the new hardware and software pick up. Right now, after the iPad 2 release and before any solid news on iOS 5 or the iPhone 5, is the deadest part of Apple’s yearly cycle for mobile devices.